One of the most fully achieved human beings who has ever lived, Leonardo remains the quintessential Renaissance genius. Creator of the world's most famous painting, scientist, philosopher, builder, he is credited with defining the accomplishments of the great flowering in human consciousness. And yet, so wide-ranging and prolific were his interests that he brought hardly any major undertaking to a final end. If he seems so modern, it is perhaps because of his non-speciality, his magpie mind and curiosity, and his thousands of notes and sketches. In these pages he would anticipate some of the great discoveries and inventions that would follow him, from key points in anatomy - such as the principles behind blood circulation - through to plans for armoured military vehicles, planes, helicopters and submarines. As well as all that, he also managed to advance numerous artistic techniques, and implicated a complex psychology into his paintings of the "Last Supper" and the enigmatic "La Gioconda", or "Mona Lisa". Famous horseman, rival to Michelangelo, military engineer to the Borgias, he died in 1519, in a chateau given him by the King of France, Francis I. Not bad for the illegitimate son of Florentine notary. "Opening this lavishly illustrated book is one of sumptuous celebration of the visual aspects of Leonardo's oeuvre." The Art Newspaper, London"
Frank Zollner wrote his doctoral theses on artistic and architectural theory (1987) and Leonardo Da Vinci (1996). He has written numerous publications on the art and artistic theory of the Renaissance and on Paul Klee. Since 1996 he has been Professor of Renaissance and Modern Art at Leipzig University. 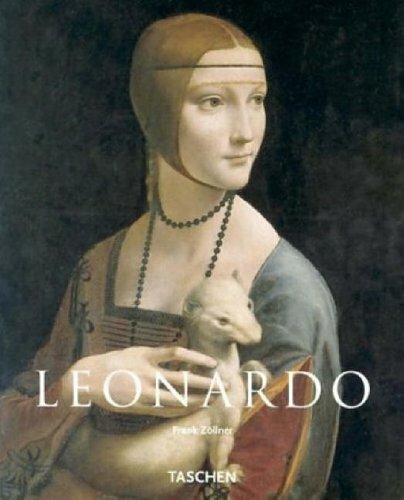 He is also the author of TASCHEN's XL monograph on Leonardo da Vinci.